What would this world be like without Nelson Mandela? Cold is the first word that comes to my mind. Empty would be another. I say this because I studied world history in high school back in the 80s where we read numerous articles about Apartheid. I was in no way the aware child back then as I am today as an adult. In fact, South Africa and its issues were so far away from my interest that I slogged through social studies without a care in the world other than wanting to be on my bike, training for another race. It wasn’t until a few years later when U2’s song Silver and Gold brought back my history lesson from high school and threw it in my face. The thing you have to know about me is that I went to a Catholic Preparatory school in Tulsa. Sadly, it wasn’t a melting pot of cultures. We only had one African American kid in our class of thirty-five, which made my well-rounded life a little more insular on the home front. It wasn’t until I got to college, which is where I started to explore issues, thanks to U2 and being surrounded by young, forward thinking students. I don’t regret my parents wanting me to have a great high school education, but it came at a cultural cost. As my senior year in college was venturing to it’s spring semester, word was hitting the streets that Mr. Mandela was going to be released from prison. I never thought it would happen. If the word was true, there would be a huge cultural shift in South Africa as the whites had been in powers for years and leading with Apartheid, a system of racial segregation enforced through legislation by the National Party governments, who were the ruling party from 1948 to 1994. That is almost fifty years of rule that had to be overturned. I could not fathom such change in short order. Especially when the United States had its own issues with the racial divide that has gone on for a much longer period of time. What made the events of February 11, 1990, Mandela’s release date, would be one of the biggest cultural shifts of all time. Now, Apartheid wasn’t abolished on February 12, but South Africans knew that there was a sea change coming. Mr. Mandela began laying the new groundwork for his party, the ANC or African National Congress. He made a statement upon his release to commit to peaceful struggle with the minority white ruling class. In time, he became president and changed the country for the better. The list of his achievements is lengthy, but what he did in four years is a stunning accomplishment. To get 1.5 million children into the education system and provide 3 million with telephone service does not sound like much, but these actions put in place the movement towards a healthier South Africa. 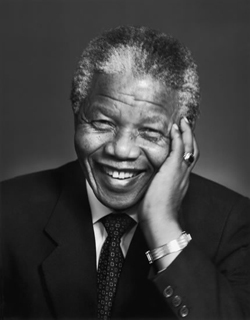 Mandela earned accolade upon accolade for moving his country forward. Today, at 94, and long since retired from presidency, South Africans can feel his heartbeat through their country. U2 feels that pulse when they are on tour, playing live in the month of July. They will stop the show and sing Happy Birthday, not to one another, but to Mr. Mandela.